Manchester United Boss Jose Mourinho has come out to explain why Mo Salah wasn't giving a chance at Chelsea and also said he shouldn't be blamed for Chelsea selling Salah. "It is the opposite. I was the one that bought. I was the one that told Chelsea to buy Salah. 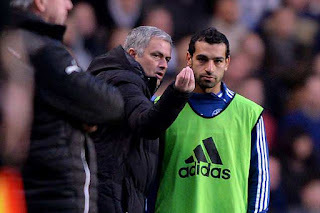 It was with me in charge that Salah came to Chelsea." "But he came as a young kid, physically he was not ready, mentally he was not ready, socially and culturally he was lost and everything was tough for him." "We decided to put him on loan and he asked for that as well. He wanted to play more minutes, to mature, he wanted to go and we sent him on loan to Florentina, and at Florentina, he started to mature. Chelsea decided to sell him, OK? "And when they say that I was the one that sold him is a lie. I bought him. I agreed to send him on loan, I thought it was necessary, I thought that Chelsea had wingers... Some of them are still there like Willian, Eden Hazard and all those players already in a different level." "So the decision to send him on loan was a decision we made collectively, but after that, the decision to sell him and to use that money to buy another player wasn't mine." "But even if it was, in football we make mistakes a lot of times, so many times some players develop in way we were not expecting, some others don't reach another level like we thought they would, so I don't even think this is a mistake, it is just part of the job." "But effectively I did buy Salah, I didn't sell Salah, but it doesn't matter. What matters is that he is a fantastic player, and I am really happy for everything that is happening for him and especially because he scores against everyone and he didn't score against us in two games." Do you think Chelsea was wrong selling Mohamed Salah?